Improving on the original EFX Bundle with its considerably more interesting, creative angle, Bundle 2 is worth every penny of its modest asking price. Good selection of creative effects. Outstanding value. Slick, easy-to-use controls. Top-class sound quality. Useful visual feedback throughout. Bonus plugins if you own both Bundles. You probably don't need all of them. 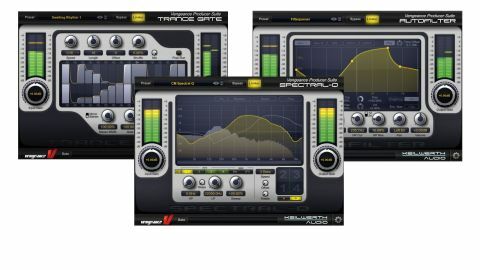 Best known for its ubiquitous sample packs and preset libraries, Vengeance Sound also produces a range of excellent instrument and effects plugins, developed in partnership with Keilwerth Audio. The latest is Essential FX Bundle 2 (VST/AU/RTAS/AAX). Like its predecessor, Essential FX Bundle, EFX2 comprises 15 separate plugins, but while volume 1 handled the bread- and-butter likes of chorus, delay, distortion, EQ and so on, volume 2 is rather more adventurous. For the purposes of this review, we'll categorise the plugins as 'creative' (Autofilter, Fuzzbox, Smear Shifter, Talkbox, Trancegate, Spectral-Q, Waveshaper, Timefreeze and Vinylizer) and 'functional' (DeEsser, Noise Gate, MB Stereo, Pitch Shifter, V-Verb and MB Transient Designer). Autofilter features high- and low-pass resonant filters (12 and 24dB/octave), alongside a pair of multi-point envelopes and two editable LFOs; plus a two-band EQ. "There's certainly no doubting the price-per-plugin value of Essential FX Bundles, or their ease of use, clear layouts and excellent sound"
Modulation targets include filter, pan, volume and EQ parameters, and both LFOs can be modulated by the envelopes. Onscreen editing of envelopes and LFOs, and various tempo sync options, make rhythmic, ear-grabbing filter effects super-easy to achieve. Talkbox is a formant filter-based processor that makes the input sound like the human voice. It has five main parameters: overall Mix, Vowel LFO with tempo sync, Formant filter position, left/right Offset and the Robotize rate reducer. These can all be modulated by two multi-point envelopes and an envelope follower, and we found that the plugin works well on monophonic sources, particularly bass and voice (adding synthetic colour to regular vocals). It can also be used to elicit cool effects from beats and keys. Fuzzbox is a simple proposition, with its two- band pre EQ helping to deliver a reasonable spread of effects in conjunction with the Fuzz level and output Mix blend controls. Smear Shifter is a twin-band FFT-based pitchshifter (+/-2 octaves per band) with adjustable Split Frequency point, adjustable FFT size (128 to 4096 bands), Oversampling and Vibrato. Beyond typical pitchshifting duties, it can conjure up a variety of creative results when blending the source and processed signals. Waveshaper is built for serious distortion duties. The XY displays (one for everything above the zero-amplitude line, the other for everything below) enable reshaping of the waveform by mapping input values on the X axis to output values on the Y axis. The plot can be rounded using the Smooth control, and range-limited with the Noisefloor parameter. Trancegate is a port of the module of the same name from Vengeance's VPS Phalanx, and it's a belter of a plugin. Typical parameters such as Speed, pattern Length, Shuffle and start Offset are augmented by Gate time, Decay time and in-display control of step Levels and Linking. The left and right channels can be viewed and edited independently, and step transitions are smoothed with the Contour parameter. Timefreeze is a powerful processor for real-time modulation of speed and pitch. It includes multi-point envelopes for Time and Pitch, plus four Miscellaneous envelopes. Our favourite element, though, is the 64-step Sequencer, with which you can automate the Freeze triggering. Vinylizer emulates the sound of vinyl records and the turntables playing them back. It's packed with parameters, including frequency response (Age, Tone and Horn), Crackle, Scratch, regular Noise, wobble (Engine), Hum and Rumble, and is quite possibly the best plugin of its type that we've ever come across. Spectral-Q is a very powerful FFT-based EQ with up to 4096 bands. The EQ shape can be drawn directly in the display using Free mode, but there's also a 'standard EQ'-like mode that provides regular peak and shelf bands. Its four EQ memories can be morphed between using the onboard automation system, and rounding things off are four envelopes and two LFOs, for extensive modulation of the EQ parameters. On the more utilitarian side of things, EFX2 includes an excellent DeEsser with display-based editing of Threshold, processing Range and upper and lower Detection circuit settings. The latter can be soloed to help with setup. "Even if your DAW has lots of built-in plugins, there's still plenty here to justify the spend"
The Noise Gate is quite straightforward, including a real-time waveform display with a yellow tracer showing gate activity. MB Stereo is a multiband stereo widener running up to four bands. It's very easy to use, with crossover points and levels for the Mid and Side signals set in the interactive display. MB Transient Designer is a two-band job with Attack, Sustain and Sensitivity controls for each band. Responsive and flexible, it's also one of the best transient shapers we've heard. Pitch Shifter is a grain-based shifter with +/-2 octaves of range, plus Grain Size, Feedback and output Mix controls, that does nothing more or less than what it says on the tin. And finally, V-Verb is an algorithm-based reverb with Modulation, Diffusion, Damping, and Filters. Useful features include Pre-Delay tempo Sync, and in-display adjustment of Decay (up to 18 seconds), Size and Pre Delay. There's certainly no doubting the price-per-plugin value of both Essential FX Bundles, or their ease of use, clear layouts and excellent sound, but Bundle 2 just feels more useful than the first one. Its 15 effects have far greater creative potential, and even if your DAW has lots of built-in plugins, there's still plenty here to justify the spend.